This recording has never been ment to see the light of day. When I entered the huge Forum pavilion at the Frankfurt Book Fair on October 8, 2002, my heart sank -- the ceiling was at least 15 meters high and a tiny stage, constructed in the corner of this enormous venue designed to accomodain a crowd of a couple of thousand people, was hardly visible. It was obvious to me that it would be absolutely impossible to make a decent recording. That's is the reason why I did not rush to the stage when the Trio finished playing encouraging them to play more. They played for 36 minutes, and since I thought the sound would be terrible there was no point to interfere. The sound engineer, however, did not share my sentiments. It was a shocking surprise for me to receive a copy of the recording some time later and listen to a quite acceptable sound. The engineer was probably a magician, and I don't have enough words to express my gratitude to him. Had I known the recording would be O.K. I would force the musicians to play more. The concert in Frankfurt was a special occasion. In 2002, for the first time since becoming an independent state, Lithuania was an honorary guest of the Book Fair taking part as a full member. On October 8, the President of Lithuania made a speech, and immediately after the speech the stage belonged to The Ganelin Trio. The fact that the Trio was invited to open the Fair speaks louder than words that they had become an inseparable part of the Lithuanion history. Never mind that Ganelin lives in Israel and Chekasin spends most of his time in Germany. 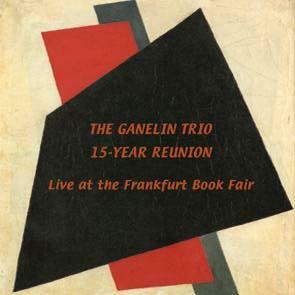 As the MC said in his introductory speech: "The Ganelin Trio is not just a band. It's a part of cultural and spiritual history of Lithuania and the whole of Europe. For many years they have not played together. And this is a historic reunion. During the first 15 years of its existance the Trio was in the vanguard of music from all over the world." And a historic reunion it was, indeed. The last time the Trio played together was in October 1987, 15 years ago almost to the day. The organisers of the concert in Frankfurt did not know what to expect. They made available about 150 seats, and they definitely miscalculated. There were about 600 people standing in a huge semi-circle totally hypnotized by what was going on on stage. Among the crowd there were journalists, writers, broadcasters and old Ganelin Trio fans who came not only from Germany, but from other countries as well. The trio started with ferocous free jazz, with Chekasin playing two saxophones simultaneously. Gradually the structure emerged with different sections filled with elements of free jazz, folk, bebop and swing. For the last section of the performance they found a beautiful theme led by Chekasin on alto saxophone. Just like many years ago, playing saxophone and singing simultaneously, Chekasin used every little pause between the phrases to make fun of himself, the audience, and the music. The end was sudden, the audience was ecstatic. The President of Lituania jumped to his feet and went to embrace and congratulate the musicians. The audience continued clapping for several minutes and eventuially was rewarded with an encore. The general consensus was the Trio played as if this 15-year gap did not exist. They are still ahead of the time, they are still as original and unique as they were 15 years ago, except that they are even greater masters than before. The Ganelin Trio is back.